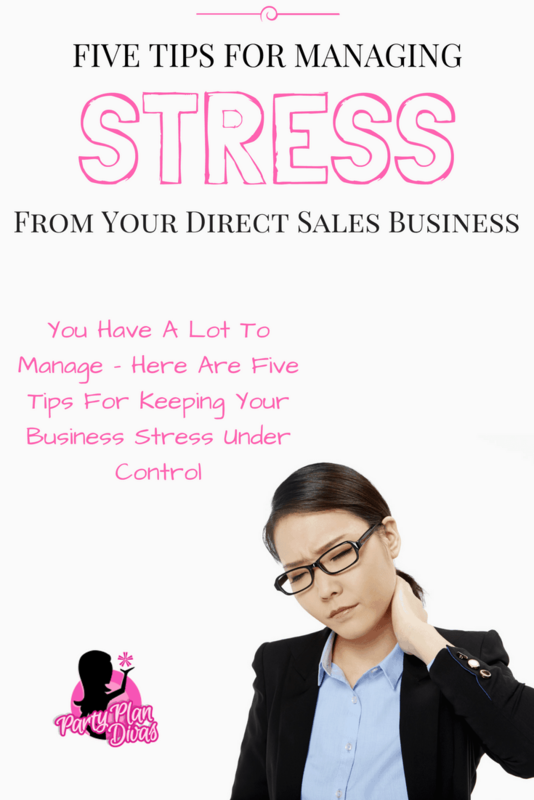 Running a direct sales business can be incredibly stressful. Even as a brand new consultant there are parties or organize, social media strategies to maintain, customer care files to juggle. As your business grows you only add to those tasks other things like training your team, organizing team meetings, “putting out fires” that arise and more. Stress can be debilitating to your business and keep you feeling “stuck.” It’s time to get rid of that stress and get back on the track to productivity. Here I have for you 5 tips to help beat business stress so you can begin to operate at your peak performance. A large amount of business stress can be caused by you having a plan for your business and not knowing exactly how to put it in action or not having a plan at all and either of these will cause you to become stuck. So it’s very important to sit down and make yourself a detailed plan for all the different aspects of your business. Your plans should outline where your business is right now, where you’re wanting it to go, and more specifically what exactly you’re going to do to get there. Our Diva Success System can help you build the foundation for a schedule that works for your business. Most business owners like to be very organized and scheduled, this makes for a completely packed calendar with things such as projects, tasks, and meetings which ultimately becomes a challenge to find time for yourself to relax. The solution to this problem is to purposefully schedule yourself some downtime in order to prevent burnout If it’s on your schedule then you’re going to be more likely to make it a priority and stick to it. With our system, we have “Slow Down Sunday” which is our Faith & Family Day. Schedule your downtime if you have to, and put as much priority on that downtime as you would any other necessary part of your business. There are so many benefits to building a business/brand based on you, but there are some things that you can delegate so that you can have more time to focus on activities that help your business grow. Things like labeling catalogs, scheduling social media posts, addressing postcards or envelopes, putting together Hostess Packets. If you learn how to ask for help and delegate tasks out to other experienced people it’ll not only allow you to be able to grow your business to higher levels, but it gives you the advantage to be able to take a break from everything and have no worries. Nowadays there are so many different types of apps on your mobile device as well as on your computer that can seriously help you as a business owner. Everything you need from helping you stay organized to helping improve productivity and even manage finances. By using these apps you can save yourself time and alleviate some frustration to keep the stress down. Check out my list of the best direct sales apps to help you manage every aspect of your business. Information overload is a very common source of business stress and once you get to the point of information flowing in from all the different places such as email, social media, instant messaging, etc. you’re going to face information overload. Here are some tricks to help you control the all the flow of information and keep your stress levels down. First, shut your email notifications off and instead check your email manually when you’re able to completely focus on it. Next, you should unsubscribe from any emails that you don’t read consistently. Finally, you should only ever open instant messaging tools if it’s for meetings that have been pre-scheduled. A lot of responsibility comes with owning your own business and all that it entails can really pack on the stress, sometimes so much so that it not only will affect you but your business as well. It can have such a bad effect that it could ultimately cause your business to fail, which is why I’ve given you these 5 helpful tricks to stop business stress. If you know of any other tips to stop business stress come share them with us in our free Facebook Community!